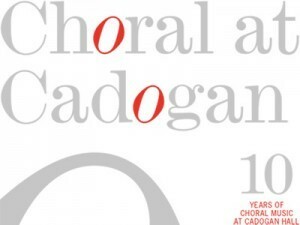 Choral at Cadogan returns to Cadogan Hall in September 2017 for the tenth series with eight concerts showcasing choirs and vocal ensembles. The Tallis Scholars, artistic director Peter Phillips, open and close the series and there are concerts from The Sixteen, Stile Antico, Vox Luminis, the National Youth Chamber Choir and the Choir of King's College, Cambridge. The Tallis Scholars first concert features Monteverdi's works in the prima prattica style, unaccompanied polyphony following the example of Palestrina, and the concert will also feature music by Palestrina, Allegri, Gesualdo and Lotti. The choir returns in June 2018 in expanded form to perform Tallis's 40-part Spem in Alium alongside large-scale works by Sheppard, White and Sutton. Stile Antico is joined by organist Oliver John Ruthven and violone player Kate Aldridge for music of the German Baroque including Schutz's Musiklische Exequien and Bach's Jesu meine Freude, plus music by Handl, Hassler, Daser and Knofel. The Sixteen and Harry Christophers bring their Christmas programme, Glory to the Christ Child, which includes Poulenc's Quatre motets pour le temps de Noel and his profoundly moving Un soir de neige alongside more popular Christmas Fare. And still in a Christmas mood, the Temple Church Choir, conductor Roger Sayer, bring their Christmas programme with a selection which moves from Sweelinck's Cnatatye domino and Reger's Maria Wiegenlied to The Twelve Days of Christmas and Howard Blake's The Snowman. The National Youth Chamber Choir, conductor Ben Parry, presents a range of music all written when the composer were in their youthful twenties, with music by Monteverdi, Britten, Owain Park, Billy Joel, Sting and more. The Choir of King's College, Cambridge, conductor Stephen Cleobury, perform music inspired by Lent and Holy Week including Tallis's Lamentations, Stabat mater settings by Palestrina and Lassus, Poulenc's Lenten motes and motets by Brahms. The Belgian group Vox Luminis, director Lionel Meunier, will be performing works by Tallis and Sheppard.